“It is with a deep sense of honor, gratitude and love that we celebrate the remarkable life of Elmer “Buddy” Cook, who passed away at the age of 83 on August 10, 2018. Buddy was born in Loreda, West Virginia, a coal mining community where Buddy was raised. As a high school student, Buddy was a star athlete on the basketball, football, baseball and track teams. Following high school, Buddy served four years in the United States Navy, deployed throughout the Pacific and Europe, and earning access to the G.I. Bill, which enabled him to enroll in college. 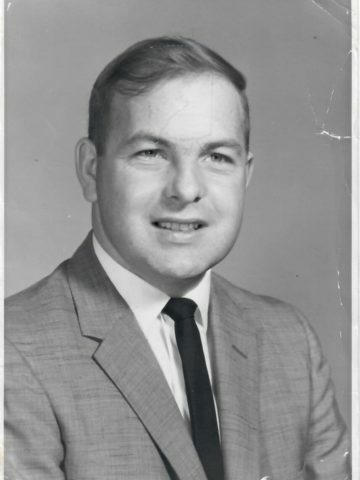 In 1958, Buddy matriculated at Concord College, where he would earn his bachelor’s degree. It was at a freshman orientation where he met Mary Etta Wright, falling immediately and deeply in love with her. Buddy married her in 1960, and remained unselfishly devoted to her for the rest of his life. Buddy earned a Master of Business Administration from Marshall University in 1962, and returned to his high school as a faculty member. In 1966, he and Mary Etta moved to Tennessee, where Buddy entered the insurance claims business, and where he and Mary Etta started and raised their family. While a young father and working full time, Buddy earned his law degree from Nashville School of Law. Buddy was an avid golfer and football fan. Buddy enjoyed ball games, beers, and road trips with his friends. Buddy was a Loyal Gander of the Honorable Order of the Blue Goose. Buddy is survived by his daughter Tracey (Cook) Hay, son Christopher Cook and grandchildren Alex Hay, Ashlyn Hay, Savannah Cook, and Austin Cook. He was so loved. Visitation will be held from 4:00 p.m.- 6:00 p.m., and service will immediately follow at 6:00 p.m., on Monday August 13, 2018 at Bellevue Presbyterian Church, 100 Cross Timbers Drive, Nashville, TN 37221. Interment will be at 2 p.m. on Thursday at Middle TN State Veterans Cemetery. In lieu of flowers, please consider a monetary donation to the Sunny Day Club at Bellevue Presbyterian Church, a service that provides support and fellowship to individuals faced with memory loss, dementia, or Alzheimer’s. Buddy will be greatly missed by many that knew him as Mary Ellen and I did.. Many great times with he and Mary Etta over many years. My husband and I looked forward every Sunday, to sitting with Buddy and Mary Etta during worship service. I will miss my seat partner. He was a wonderful member of our Sunny Day Club and LOVED playing bingo and all of the other games. His bright smile brightened the day for everyone. When he didn’t attend, people always asked, “Where is Buddy today”. My heart felt sympathy goes out to the entire family. I hope the wonderful memories of your Father/Grandfather, will carry you through during this time of loss and sadness. My mom and dad were great friends with Buddy and Mary Etta. So many of their outings it was the Carter’s, Alspaugh’s, and Cook’s! My sympathy to all the family. We’ll miss our great visits with Elmer/Buddy! What a great friend, teacher and boss! We had so many good laughs and these memories will get us through this sad time! We’ll miss our Uncle Buddy greatly. We have so many fond memories of our mother’s brother. We always enjoyed his visits and looked forward to seeing him and Aunt Mary Etta. They were two of the most kind and loving people that we have had the honor to know. Our thoughts and prayers are with the family at this difficult time. We always enjoyed visiting with Buddy and Mary Etta before she passed. He was a very kind and gentle soul, he will be missed. Sincere sympathies to his family. My sincere sympathy to the family of Elmer for their loss. Elmer was a wonderful person and I am so sorry to hear of his passing. I will miss his friendship. My prayers are with his family in this difficult time. Sending our love, condolences and prayers during this difficult time. I know Buddy will be missed by so many. I have been raised hearing all the wonderful qualities of Elmer as well as some pretty good stories involving my Mom and Dad, Kathy and John Ross. My family wishes to convey our deepest condolences to the family. I know you will miss him very much. The comfort I have received when losing my loved ones comes from the Bible. That comfort is found in the Creator’s word at Revelation 21:4, which promises, “He will wipe out every tear from their eyes, and death will be no more, neither will mourning nor outcry nor pain be anymore. The former things have passed away.” My family and I hope this promise brings you comfort and hope as well. Elmer was a family friend and very loyal to my parents, Bill & Ruth Harless. Elmer taught me how to pass a spiral pass with a football when I was @ 10 years old. To my brother and I he was more like an Uncle than a family friend. Always laughing and telling great stories he is sadly missed. RIP Elmer we miss our golfing and basketball games. Elmer (Buddy) to us was a dear friend when we were in HIgh School. My brother Jerry Daniels and he remained friends til Jerry Passed away last December, we loved him dearly. Auf wiedersehen for now, Old Friend. I will see you in Heaven some sweet day. Rest in peace!